It is usually recommended to set the line-height lower than the step unit. The used line height can increase due to several factors such as the use of vertical-align or font fallback. Tells user agents to set the used value to a "reasonable" value based on the font of the element. The value has the same meaning as <number>. We recommend a used value for 'normal' between 1.0 to 1.2. The computed value is 'normal'. Actual implementations are know to vary, and in practice the actual numerical value of line-height: normal is unpredictable. Ideally authors will not rely on it and manually set the line-height when they want to use line-height-step, but we should try to be robust when they don't. If normal in a particular browser on a particular os with a particular font is equivalent to 1.15, and on a different browser/os/font combination, it is equal to 1.25, and an author leaves line-height at the default value, and sets line-height-step to 1.2em, things will look fine in one browser and not in the other, and the author may not know if they do not test in that particular browser/os/font combination. I think it is quite important to reduce or eliminate this kind of situation, so we should do something. When line line-height-step is not 0, then line-height: normal is treated as line-height: 1 when computing the used value. This would usually be appropriate (and in the odd case where it is not, it is always possible to set a manual value), and would eliminate variation between browsers, making naïve use of line-height-step more robust. I understand the motivation, but I'm not a big fan of adding more automatic magic behaviors. line-height: normal causing different layout by browsers/platforms are already widely known facts. Most recent reset.css has line-height: 1. Fixing it automatically only when line-height-step is set looks like we're recommending not to to set line-height. We're not, correct? Also, the problem you state isn't limited to line-height. What if author forgot to set font-size? If the font-size is larger than a test device, it may result in two units, but we can't fix it, correct? I have a mid preference to let authors to deal with their errors, and minimize the magic behaviors in the platform. line-height:normal being a little different depending on the browser is not a major problem when step sizing is not involved, because the differences are subtle. In this case, the differences could be large (some browsers/os/fonts combinations getting double spaced, some other not), and the fix seems easy. When the problems are obvious and the solutions hard, leaving things up to authors is fine. Here it's not the case. If we make behavior dependent on whether or not line-height-step is initial, the initial value needs to be none. that was what I wanted to ask but probably failed, sorry about that. I'm fine to add none if desired. Added i18n label because this proposal will cause lines to overlap for some scripts. Follow up fix to #938. There were some points what I said didn't seem to be understood correctly, or I didn't understand even by reading IRC log, so appreciate to read through and comment here if any. line-height: normal doesn't produce a robust layout as discussed, and I agree that a robust layout is one of important principle in CSS, and that line-height: normal is against that. The purpose of line-height: normal is different; it is designed to avoid line overlaps as much as possible. Making any text readable without unexpected overlaps is also one of important principles in CSS. These two important principles conflict to each other. I think that is why line-height gives a choice to authors, and I think CSS chose the right default because overlapping is worse problem. What I was trying to say at the weekly was that we need to give the choice to authors regardless rhythmic sizing is used or not, and IIUC this is also what @litherum was trying to say. I made a multi-script sample text here (credits to @r12a and @aphillips, thank you!) For scripts in this example, I hope you see normal works perfectly in all browsers, but if we were to pick one fixed value, probably "1.8" is a good value. But I saw an example where "1.8" wasn't still tall enough before. Pick "2"? But it's too tall for some other scripts, such as Latin. Or, maybe, I wonder, from @fantasai's comment above, this point was understood but cases where font metrics-based line height and rhythmic sizing used together was not understood? If that's the case, I'm quite sure this case is common; author wants a constant rhythm, such as 18pt. The page has CGM that text can be in various scripts. Author wants to prioritize "lines not to overlap" over "possible additional space when falls back to bad fonts occurs," because font fallback is more predictable than CGM text content. In this case, the combination of normal and rhythmic sizing is what the author needs. 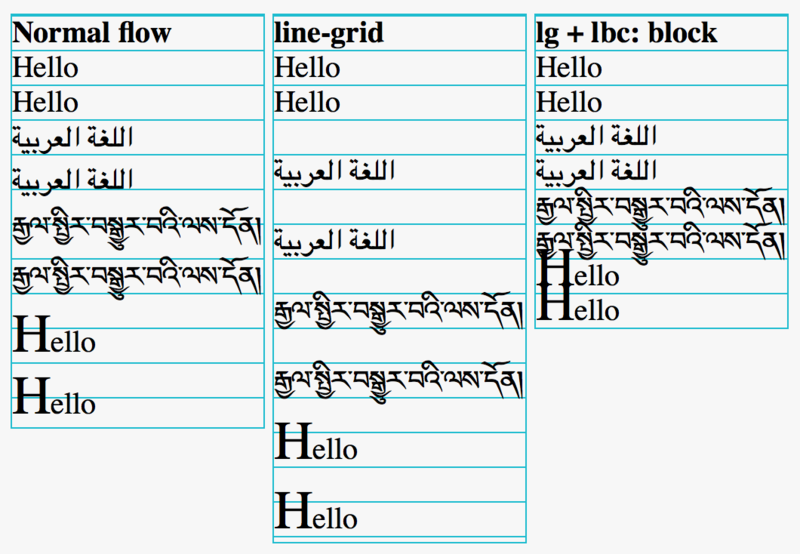 If the author uses line-height: normal, Latin lines will fit to one step unit, while Tibetan may fit to two or three step units, but still the rhythm is kept. ...or maybe concerns discussed there was different from either of above, appreciate if someone can explain more if so. Talked with @tabatkins offline, he said he might try to come up with a new proposal, so I look forward to seeing it. He also said it became clearer after we talked, so I guess I didn't do good job in conf call or comments above. Sorry about that, let me try to simplify the points. I understand the interop problem with line-height: normal. I understand there are cases where rhythmic sizing may make the issue (1) worse. I believe this proposal sacrifices a CSS readability feature for tall scripts. I think this proposal is net negative, given (3) looks more critical than (1) to me. I mildly prefer solving the original issue (1) altogether, not only the worse one (2). Happy to discuss more if anyone can come up with new proposals, or disagree with me on 3-5. Blink is considering shipping line-height-step. Please let us know if there's a specific proposal here for changes which could cause a web compat problem in the future if we were to ship now. If approved, line-height-step support could make it to Chrome stable as early as June, so we'd still have a few months to safely make breaking changes or pull the feature if consensus can be reached. Alright, I think I have a solution that lets line-height:normal fulfill its purpose and solves the double spacing problem we've been discussing. When setting the line-heigh-step, you (almost?) never want to set it to something smaller than the line height of the element that establishes the rhythm. When inheriting line-height-step, you do want it to be able to be smaller than the line height of the element it is inheriting into. That is what enables things like titles to be enlarged to a multiple of the step size. <length> safe computes to max( 1lh, <length>) unsafe. Nb: lh resolves at computed value time to an absolute lenght, so the computed value of line-height-step, and therefore what we will inherit, will be an absolute length. safe computes to max( 1lh, ) unsafe. Nb: lh resolves at computed value time to an absolute lenght, so the computed value of line-height-step, and therefore what we will inherit, will be an absolute length. What is the computed value of max(1lh) when line-height: normal? I tried to learn what the lh spec says, but I can't read from it. Could you write down in more plain English? BTW, a discussion at mozilla.dev.platform clarified that the use cases (and thus desired behaviors) are different between mine and Latin. This has been gradually understood, if I think now, but I was unconscious. The discussion was so much helpful to clarify that. So I added a section about East Asian Casual Vertical Rhythm to clarify different two (or three, not sure at this point) use cases, and which property and combination works good for which use cases. I'm under impression that even for the strict vertical rhythm, Latin and East Asia are different enough that we're likely to end up with 3 different behaviors; 1) East Asian Casual, 2) East Asian Strict, and 3) Latin Strict, but maybe we can merge 2 and 3, or other writing systems have 4th or more use cases. That should be figured out sometime in future, but as I wrote there, I'm focusing on East Asian Casual first. line-height:normal behaves the same as if a number was specified, except the author doesn't know what that number is, since it depends on the font (and on how the browser chooses to deal with it). But once the browsers knows the font and the font size, it can know how many pixels tall a line is going to be when line-height is normal. That's 1lh. Of course the actual line might end up being taller if you change font size on inlines, or have inline images, or superscripts... But assuming a line with nothing special in it, you know how tall it would be. or 20px is smaller, in which case it's rounded up to the whatever the size of the line would be, and then use & inherit that rounded up value. I think that should cover 99% of the use cases (which is why I made "safe" the default), and if you actually want the unsafe behavior, you can ask for it. If it's a length unit, it needs a definition of 'normal' that doesn't depend on text. Tells user agents to set the used value to a "reasonable" value based on the font of the element. The value has the same meaning as . We recommend a used value for 'normal' between 1.0 to 1.2. I'm sure we can find some wiggle room in that phrasing, but regardless, I would indeed favor a definition of 'normal' that doesn't depend on text. The alternative is just going to make everything more complicated. @frivoal, I'm so disappointed at my English skill, I still can't understand what the proposal is after tens of minutes of try. Could you try plainer English, or meta-code if possible? 20px is the specified value of 'line-height-step'. "natural line height" is the used line height from the layout result before rounding is applied? "as you specified" means the specified value of 'line-height'? This logic doesn't make sense, so I'm probably lost somewhere, but don't know what it is. If more than one font is used (this could happen when glyphs are found in different fonts), the height of the content area is not defined by this specification. However, we suggest that the height is chosen such that the content area is just high enough for either (1) the em-boxes, or (2) the maximum ascenders and descenders, of all the fonts in the element. Note that this may be larger than any of the font sizes involved, depending on the baseline alignment of the fonts. If UA chose to do (2), "all the fonts in the element" depends on text, and that's all 4 browsers do today when line-height: normal, as @dbaron pointed out. The CSS Working Group just discussed Avoiding accidental double spacing. <rachelandrew> fantasai: can we resolve on fixing this? <rachelandrew> florian: the value of the line-height property does it change based on content on the line? <rachelandrew> does that property vary per line? <rachelandrew> florian: do you need to do layout to figure out the pixel value of line-height? <rachelandrew> dbaron: for the lh unit or for layout? <rachelandrew> what does the UA pick the number based on? <rachelandrew> dbaron: do you then use the normal? <rachelandrew> florian: how is this not a violation of 2.1? <rachelandrew> koji: does this change based on inheriting? the <number> value means this element's step size (a length) is computed based on the element's properties. Values smaller than 1.0 are invalid (or changed to 1.0). The step size is computed by computing the height a line box would have if it contained glyphs from all fonts in the font-family list (given the other font properties), i.e., using the ascent and descent of each, and the line-height (which might be normal and thus lead to using external leading), and then multiplying that result by the <number> value. So the problem with this as that it doesn't actually solve the font fallback problem, since font fallback often fails to find a glyph in the font-family and has to fall back to searching for other available fonts. So on further consideration, maybe font fallback isn't as much of a problem as I thought. Then I think the remaining question is that we don't actually know what line-height: normal means (#1254), and which fonts' metrics it considers. If all of the font metrics that could ever be considered for line-height: normal are considered when evaluating the step length from line-height-step: <number> as I propose above, then I think things would be ok. Whether it will make sense to authors and let them express the thing they want in an understandable way (I do not know yet). I agree that in your example the double-spacing of the Myanmar and large capital text in the second box is largely intentional, and not relevant to this issue. The Arabic case might be relevant. I think that if there were browser differences in dealing with how the Arabic line height interacted with a line grid such that one browser double-spaced the lines and another did not, that's the case that this issue is worried about. But it looks to me like this example should be fairly clear-cut - the Arabic line-height is several pixels larger than the grid spacing. The third box doesn't look like an improvement to me, because it's tightening the specified line-height too much to squash the lines into the grid. So I think the example would have to be a closer call for this issue to come into play. The line-height needs to be closer to (and smaller than) the grid spacing, such that there's clear authorial intent to not get double-spaced lines. This issue is then relevant if there are enough differences in text rendering between browsers and platforms that accidental double-spacing occurs. Thank you for the confirmation, that is really helpful. This is great, this is I was most worried about. Having your thoughts helped me a lot, thank you. The Arabic case might be relevant. I think that if there were browser differences in dealing with how the Arabic line height interacted with a line grid such that one browser double-spaced the lines and another did not, that's the case that this issue is worried about. Great again, thank you. Yeah, there will be differences by browsers/platforms, both in Line Grid and Rhythmic Sizing, because font metrics of the same font name varies by platform or even by versions of the same OS, and as we figured out, how browsers compute the height of line-height: normal vary. What I don't understand is, how we could solve this when things are working exactly as intended by font designers but does not match to authors intention. I'm feeling we need to rely on heuristics, but I'm not confident of this part of my understanding yet. But it looks to me like this example should be fairly clear-cut - the Arabic line-height is several pixels larger than the grid spacing. The third box doesn't look like an improvement to me, because it's tightening the specified line-height too much to squash the lines into the grid. Great, so you think Arabic should do the 2nd box, do I understand correctly? I agree, and I was afraid people prefer the 3rd box. If a browser with the hard-coded minimum of line-height implements Line Grid, it will produce the 3rd box. Is this difference what we want to solve in this issue? I don't understand this paragraph...are you suggesting to change the example? I am suggesting the example needs changes. As it is, it does not seem relevant to this issue to me. Google Translate helped me for the first sentence, then understood the rest. Did you write "smaller" when you want "slightly larger"? If the used line-height is smaller than grid, there will be no double spacing. To adjust the used line-height in details, I need to look into font metrics value in the debugger, but I don't have WebKit build right now. I'll try to get one, but it looks like my understanding of the problem is correct. My next question is do people agree this is a heuristic problem, but let's discuss in the call. The Working Group just discussed Avoiding accidental double spacing. <tantek> is it just a button? I thought this was the first draft on the new system? <dael> koji: astearns gave me feedback that...the left most in the e xample is normal. Second I applied line-grid. I applied line-box contain to third. <dael> koji: Second block has some double spacing but astearns says they're all intentional. Is that common understanding within this group? <dael> myles: I think you're asking me? <dael> koji: Yeah. We need to distinguish intentional and accidental double spacing and there isn't a clear definition. <dael> koji: The second box is [missed] it happens accidental when font metric is only slightly larger. is that correct? <dael> astearns: one thing I missed when I commented is that in your example you are not chaning line height. it's all the same, but there are some fallback fonts making some lines taller. <dael> koji: Correct. it started with line-height normal and it does double step. <dael> astearns: Right. With that new understanding I believe you are correct that this is an example of the problem stated by the issue. 2nd is accidental line spacing because the author had line height normal and the grid set to something without double spacing. <rachelandrew> someone will need to point me to how to publish the WD, me being a newbie. <dael> astearns: IN my mind this is an intentional result of the feature. You use rhythm to get consistant spacing, but the content is such that you don't get it, so the spacing is forced by the grid so the result is what authors should expect. <dael> koji: Are you saying this is intentional or acicdedntal? <dael> astearns: Accidental in that if the author didn't know what content would go into their grid, they didn't have control over the fonts used, the person settin gup line grid might not have expected it. But they chose a rhythm, chose a grid, so we're fitting author intent of using a grid. <dael> astearns: I think this is an example o f the issue as stated. I personally don't think the issue is terrifically important because author said they wanted to use a grid or rhythm. <dael> koji: Thank you, that is exactly my understanding. florian do you have different opinion? <dael> florian: I'm struggling with how to say my opinion in 10 minutes when in last F2F we tried to discuss and didn't conclude in 2 horus. <dael> florian: I think when you have a case of line-height normal and then step to a value and large fallback the feature works as intended. Similar case, technically, is line-height: normal line-height-step to a specific value, and the main font on the engine happens to be a little too big and everything is double spaced. That' snot what authros want and I don't know how to fix that. <dael> florian: First problem happens with line-grid but the second one you don't have the same problem becuase line-grid falls out of main font size. <dael> koji: but if you go to single grid in that case lines overlap. Grid is fixed height, line-height is normal, and main font is lager. <dael> florian: Line-grid you don't set it. That's the point. <dael> koji: what you're saying is line unit is fixed size and line-height: normal and the primary font is taller then spec. unit. Is that the case? <dael> florian: I think yes, I didn't hear you clearly. <dael> koji: If you compress the font to a single unit they overlap. You said the font is taller then the unit, right? <dael> koji: Let me confirm. You said unit is fixed size. <dael> florian: I said line-step-height is fixed, line-height is normal. That font on that system gives a line-height taller then step you set for primmary font. <dael> koji: If the font is taller and you try and fit in a single step you overlap, right? <dael> florian: Line-height is normal. They're larger then your step so you double space everything. <dael> koji: Yousaid that's a problem? <dael> florian: Double space everything is a problem if the rhythm works in general and some fallback is taller that's working as intended. If everything is double spaced that's not working as intended. <dael> florian: Primary font...I can't do this in 5 minutes. <fantasai> florian: I tried for hours and failed. <dael> koji: [missed] We mostly discussed which features people break and htat's not related. <dael> Rossen_: For the sake of furthering this, I think in summary I've heard that florian's main objection is in case of fallback font being slightly lrge then primary you will have double spacing when fallback font is used. <dael> florian: That is how it works and ingeneral not a problem. <dael> Rossen_: And because of this you expect everything will have double spacing? <dael> florian: No, what I'm saying is when the autho sets a value for line-step-height they don't know what the result of line height calculation will be so they cannot set it in a reliable way. So there is a possibility that things will look right on one browser and not in the other because different font metrics. That's not what hte author wants and a limmitation. The double space everywhere on every brwoser is what's wanted. <dael> koji: I think I understand your point much better. I'll prepare another test to see if my understanding is correct. <dael> Rossen_: Sounds great. How about we try and wrap here. Seems like there's more clarity for koji in test cases you need to look at. Why don't you create the test cases and bring them back. <dael> Rossen_: We'll take time during F2F on this, but if we can resolve before even better. <dael> Rossen_: Okay for both of you? <dael> koji: Okay for me. <dael> florian: I have no obj to koji trying things out. I don't think it'll change what I think of this feature. <dael> Rossen_: That's the top of the hour. Have a great day/night and we'll talk next week. <tantek> next week is different time right? I agree with the point Florian made in the minutes above. The problematic case isn't one where there are some fallback fonts that cause things to be double-spaced. The real problem is if there's a fallback that causes everything to be double-spaced. The simplest example I can think of is one where you have two fonts that the author specifies - FontA and FontB. FontA is present on the developer's machine, but they know it isn't present on some other platform so they list FontB as a backup. All of their content can be rendered in FontA or FontB. Unfortunately the developer does not know that FontB has metrics that make the default line-height slightly larger. As currently defined, with line-height-step the author has to choose a value, and they will choose one that works with FontA. If the value they choose is too small, all of their content will be double-spaced on the FontB platform. As currently defined, with line-grid the author does not choose a value. By default the line grid will be established by the font metrics of FontA on the developer's machine, and by the font metrics of FontB on its platform (since it's the first available font). So content will not be double-spaced with line-grid in this case. Is this a fair restatement of the issue, @frivoal? Is this a fair restatement of the issue? Yes, this is excatly what I meant. Similarly to what you said above, FontA is available on one system but not the other. On the other, instead of FontB, you get some default system font. Otherwise the logic is the same. "FontA" is a webfont defined through an @font-face, and there's some network connectivity issue of some sort, and FontA doesn't get downloaded, so you get some default system font instead, and get the double spacing vs not double spacing problem without even having to change browser. The font metrics of "FontA" are computed differently by different browsers. For an example, see this font I was using in line-height tests: https://github.com/frivoal/web-platform-tests/blob/line-height-experiments/css/css-line-height/support/Revalia.woff Chrome gives this font a significantly taller line-height than firefox does. So for this font, if an author developped the page on firefox and picked a size that worked fine there, you could get double spacing everywhere in Chrome despite using the same font. Thank you for your replies, it gave me a new understanding of the problem. Is this issue suggesting to add e.g., auto to compute the step unit from the used line height? If that's the case, I'm ok with it, it's just not in any use cases and no one made such requests ever. If author uses normal to make the design i18n-friendly, here is the modified example jsbin (again for Safari to view). As you can see it, if the content uses taller fonts, there's a fallback that causes everything to be double-spaced. So I don't see much differences, but I understand our assumption on how authors use Line Grid is different, and if auto can save some English cases, I'm fine to add it. Is this issue suggesting to add e.g., auto to compute the step unit from the used line height? If that's the case, I'm ok with it. I don't think that is what was being suggested, but I suppose it would make things better. This means that if we go with an auto value, we probably needs to reuse a logic similar to the one I suggested in #938 (comment), where auto computes to the height of the line in px. That way, when you set something to auto, it gets the right height, but it keeps that same height when inheriting on descendants, preserving the rhythm. auto computes the height in px the line would have if it only contained the strut. And this should come with a large warning telling authors to use auto rather than <length> to avoid interop problems. it forces authors to type "unsafe" to get the behavior that has interop risks, and hopefully this will have enough of a deterrent effect that things will be alright. I do not think this has anything to do with English vs Japanese. The example @astearns gave in #938 (comment) and the ones I gave in #938 (comment) are equaly likely to happen in any language. Great, we're getting to the consensus. People wants half-rhythm. This doesn't align lines across columns, but still gives a good rhythm, and consumes less spaces, and that this is suitable for mobile scenario. For this use case, safe/unsafe doesn't express its intention very well. none was discussed before, but fantasai didn't like having two ways to turn it off, and we can't eliminate accepting 0, so it was removed. So, shall we start with auto | <length> and see what it happens? Also are you ok to add <length> to Line Grid as well? This is the largest feedback I've got so far in terms of numbers. If you're getting feedback that line grid needs a <length> somewhere, please open a separate issue so that we can discuss the use cases. I haven't been convinced it's necessary. please open a separate issue so that we can discuss the use cases. I haven't been convinced it's necessary. Ok, thanks, will do so. Alan's suggestion above gave me a hint for another idea. As I understood last week, @frivoal is not trying to solve the problem itself but wants to solve by making it harder for authors. I, and IIUC @tabatkins / @shans / @dbaron as well, were all trying to solve, with heuristics or with side effects, so none sounded to him. I didn't understand his proposal because it didn't seem to solve, until I understand he's trying to solve by making harder. Proposal 1 makes this specific case harder to appear unless author adds unsafe keyword. Proposal 2 does so unless author adds line-height property twice, once to set to a fixed value and then to set to normal. I prefer proposal 2, for the simplicity for authors. Also it makes compatible with Line Grid that we can discuss if/how to support <length> for both features together. EDIT: originally, none|auto but it doesn't work, so match-parent was added. The worry I have with going with none | auto to start, then introducing <length> later is that we still run into all the problems described above when you re-introduce <length>. Since auto is not the default it just becomes one of the options, and when the author opts into a <length> the differences between this length and the specified and used line-height all come back into play. @koji, please do not characterize another working group member's efforts as "not trying to solve the problem." Let's continue the discussion here and come to a better understanding of both @frivoal's proposal and @dbaron's new writeup https://github.com/dbaron/css-line-spacing/blob/master/explainer.md before we come back to this on the call. @astearns sorry for my vocabulary, I can't find good words to express "we would like the problem to persist if author added a unsafe keyword." That's what I understood, but great if I were wrong. Also note that given Mozilla's feedback in Paris, Japanese companies started creating sites. I hope they can use new syntax if we were changing. I guess I understood what you mean better now, better way to say it is "solve it by making it harder for authors". Sorry about that, I'll edit. For your first comment, I'm thinking we can live without <length>. Hopefully that resolves your concern? @kojiishi, my proposal had length and unsafe and safe and all that stuff because as far as I could tell, you insisted on having length, and I was trying to make that safer without removing length. As you know say you can live without it, things get much simpler, and we don't need all that stuff anymore. I prefer proposal 2, without much hesitation. On the other hand, I will need a bit more time to think carefully between this vs dbaron's proposal, vs current line-grid, to understand if they are complementary proposals, or if one makes the other unneeded, and if so, which one. @kojiishi @frivoal While this does seem to be an improvement in addressing some of the concerns, I think it is improper for us to move forward with this feature without any sort of concrete, realistic use case to justify it and to ensure that our design is fullfilling it. I believe @kojiishi had an outstanding action item to provide some, and I think I'd prefer to have those use cases to discuss first so that we actually understand what we're trying to solve before we decide how we want to solve it. @fantasai can you open a new issue, or request discussion by e-mail? It's a great feedback, but not related with this issue. It's a great feedback that it means the Tokyo session was a failure -- it was one of the biggest objectives to get understanding. I think this is hard because both sides discuss based on their common sense, but the common sense is different, and neither side understand how. I'm getting better understanding how Latin vertical rhythm is different, so I think I can do that better next time. Another idea from a Japanese feedback is similar to Shane's heuristic idea, but apply the heuristics to the rhythm unit rather than line height. This makes sense to me, because as it was pointed out in earlier comments in this issue, this happens when the rhythm unit is between 1.0 and 1.2. When above 1.2 and if double spacing occurs, it's very likely to be intentional than accidental. I'll try to summarize proposals so far. Category 1 is not needed for Line Grid, but category 2/3 are probably needed for Line Grid as well. EDIT: Note, in the comment above, @frivoal said the original intention of this issue is about making it harder, but it looks like Alan and dbaron's proposal extended the coverage of this issue, so this summary includes both. I'm open to discuss these two together, or separately.